Welcome to my visual diary of the beautiful birds I photographed during the summer months. I was so blessed to photograph a new species for me, an Atlantic Canary, which I photographed in my backyard. 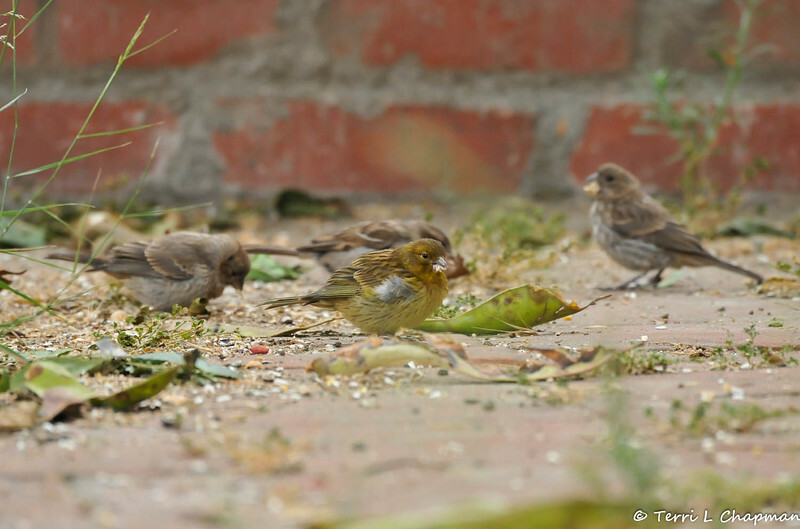 The yellow colored bird in the middle of this image (surrounded by female House Finches) is an Atlantic canary (Serinus canaria) and known worldwide simply as a wild canary. It is also called the island canary, canary or common canary, and is a small passerine bird native to the Canary Islands, the Azores, and Madeira. I photographed this bird in my backyard on July 5, 2015.